Avery joined Circus Juventas in Minnesota in the summer of 2005 at the age of 11, and immediately fell in love with circus performing. 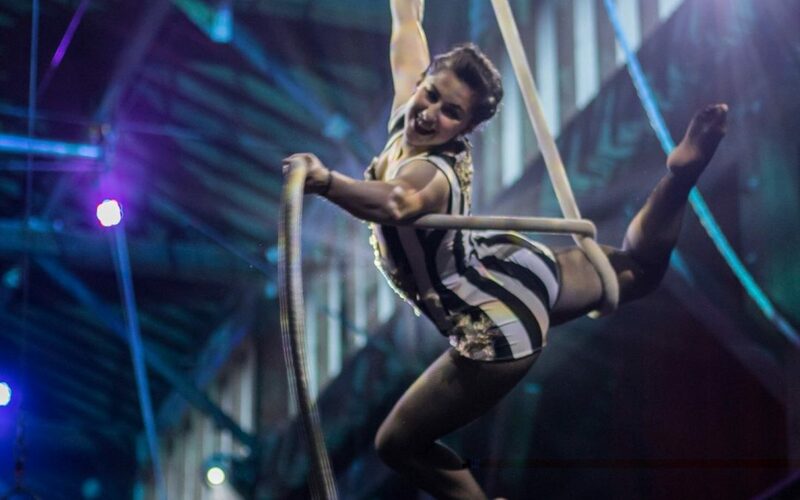 As a former soccer player, dancer and choral singer, Avery took to circus like a fish to water. Since then she has trained under world-renowned coaches and performers on a variety of apparatuses. Over the ten years of training and performing, she learned twenty different apparatuses, and performed seventeen, including Spanish Web, Single Point Dance Trapeze, Silks, Duo Trapeze, Hand-Balance, Spinning Cube and Triple Trapeze. With Circus Juventas, she worked on seven contemporary circus productions as both a character performer and an aerialist for audiences from 500 to 1000. In addition to large productions experience, Avery has performed in nightclubs, and for dozens of private events. Avery was also a member of a triple trapeze team that competed in a 2010 Circus Festival in Sweden, where her team took home first place in their age category. An instructor as well as a performer, Avery first began coaching as a 14-year old student, learning how to teach alongside coaches from countries and companies around the world. Avery emphasizes technique and form in her coaching and performing, and now loves teaching as much as she loves being on stage herself. In addition to her performance experience, Avery has a love of costuming and makeup that has grown from childhood. Her knowledge of fabrics and garment construction was gained through a year-long work-study position in a professionally-run, theatrical costume shop, as well as several years of assisting professional and amateur costumers alike in production and maintenance of costumes for dance and circus performances. She has also worked as both a wardrobe and prop styling assistant on photo-shoots for several national brands, including Target and Select Comfort. Through Circus Juventas, she learned to design and apply makeup in the style of Cirque du Soleil, and managed and co-managed the student team of makeup-artists for the 29 shows run each year over the course of three years. She has expanded her knowledge over nine years of study and exploration, as well as learning from several makeup artists currently working in the field on commercial and editorial photoshoots.